German and Japanese suppliers teamed up to help Volkswagen offer an optional gasoline-electric hybrid system in the new second-generation Touareg. Sanyo Electric Co. supplies the hybrid premium SUV's nickel-metal hydride battery and Robert Bosch GmbH contributes the integrated motor generator and power electronics. Denso Corp. delivers the electric compressor and the battery-cooling fan. The hybrid Touareg has a 3.3-liter V-6 gasoline engine combined with an electric motor integrated into the front of the transmission housing. The hybrid Touareg can travel short distances at speeds up to 50kph (about 30 mph) in full-electric mode and uses 8.2 liters of fuel per 100km (28.7 U.S. mpg). VW unveiled the new Touareg in February 2010. The car made its public debut at the Geneva auto show in March that year. 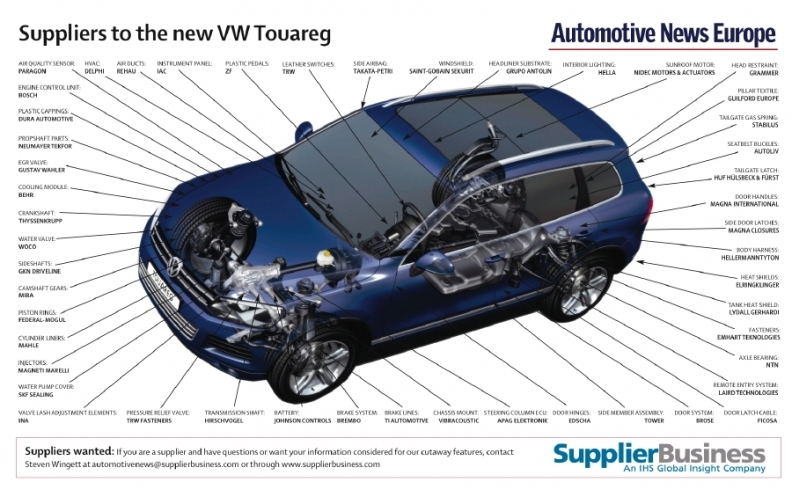 The new Touareg shares the hybrid technology with its platform mates, the Porsche Cayenne and Audi Q7. All Touareg engines are combined with a new eight-speed automatic transmission from ZF Friedrichshafen AG. Hella KGaA Hueck & Co. contributes headlamps to the new adaptive lighting system on the Touareg. The system scans the road ahead with a windshield-mounted camera and uses software from VW to determine the exact position of any vehicles ahead. This information is used to regulate a cylindrical shade fitted in front of the headlights. By precisely moving the shade, other traffic can be shielded from the glare of the Touareg's headlights while leaving everywhere else illuminated. This ensures the driver has optimum visibility without causing discomfort to other motorists. The system is a variation on camera-based lighting technology found on the Audi A8 and Mercedes-Benz E class. On those models, the headlights dip automatically in response to oncoming traffic. Hella's other important contributions include the Touareg's LED brake lights, interior lighting, overhead console and its lane-assist, which keeps the car from straying outside its lane.